This is a Holga photo by Chris Bennett from the late 90s. When he took it he had no idea what would happen to the towers. It was just a skyline shot from the New York ferry. 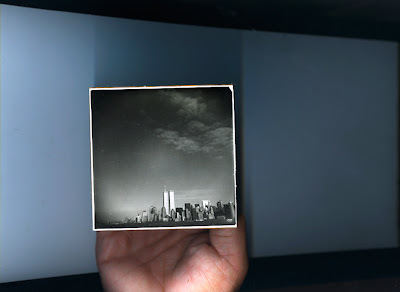 By the time I first saw it —on the wall of a coffee shop in Portland— the towers had been gone for only a few years. But even though the photo was fairly recent it seemed to capture a completely foreign time. Holy crap, I thought. They're so bright and shiny. Did that world actually exist? I arranged a photo swap with Chris and his twin towers picture wound up on the mantle in my stairwell where I pass it several times a day. By now it's quite familiar. Yet every time I walk by it still gives me a little shock of the exotic. It looks like an apparition from 100 years ago. I know we romanticize the past. There's a tendency, especially as one advances through middle age, to declare things were better back then. Simpler. More wholesome. Different in some fundamental way. Normally I'm not very nostalgic but in this case I think it's true. That world was different. Psycho killers hadn't yet invaded. It was before the Bush wars, airport body scanners, and the economic meltdown. Few people had heard of al-Qaeda or the Taliban. The national psyche was still somewhat intact. Holy Crap. Did that world actually exist? And just a decade ago? If not for the photo I might doubt it.